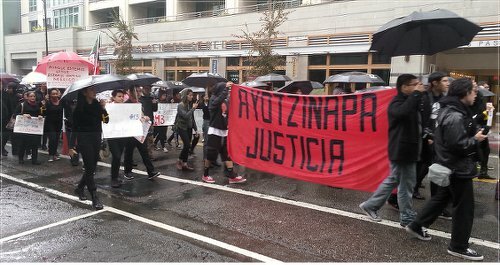 On Nov. 20, people demonstrated all over Mexico and the world in solidarity with Ayotzinapa, Guerrero, and against President Enrique Peña Nieto, including in cities across the United States. 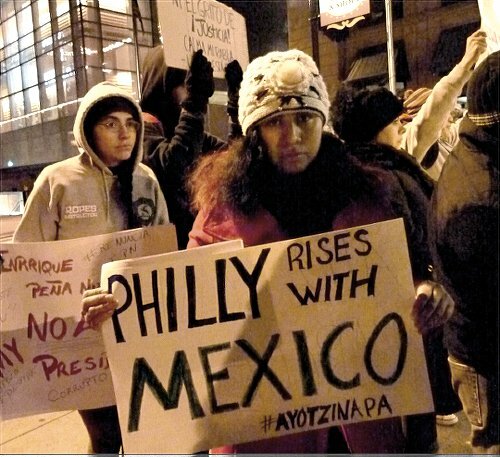 In Philadephia, more than 150 people protested in front of the Mexican Consulate. In the California Bay Area, more than 200 people marched in the pouring rain from City Hall in downtown Berkeley to Sproul Hall on the University of California, Berkeley campus. They chanted (in Spanish), “Alive they took them, alive we want them.” In New York hundreds of people were at the Mexican Consulate and then held a die-in at Grand Central Terminal. Reports and photos from Joe Piette, Terri Kay and Anne Pruden.